Bicycles are often cited as the most efficient modes of transportation in the world. They’re five times more efficient than walking, and 100 calories on a bike can send a person three miles. In a car, 100 calories would only take a passenger 280 feet. Silawat Virakul, Torsakul Kosaikul, and Suvaroj Poosrivongvanid are the designers behind the award-winning idea. The bicycle presents a next-level functionality to bicycles as environmentally sound vehicles—to the point where the rider not only uses a clean mode of transport but also helps to purify the air along with the ride. 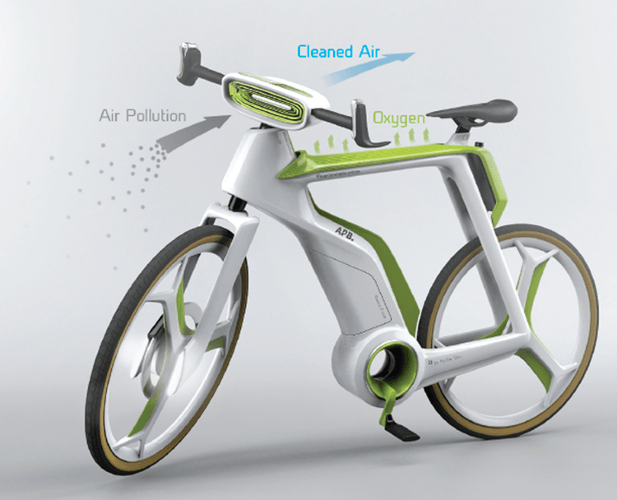 They said their Air-Purifier Bike incorporates an air filter that screens dust and pollutants from the air, a photosynthesis system (including a water tank) that produces oxygen, an electric motor, and a battery. "While it is being ridden, air passes through the filter at the front of the bike, where it is cleaned before being released toward cyclist. 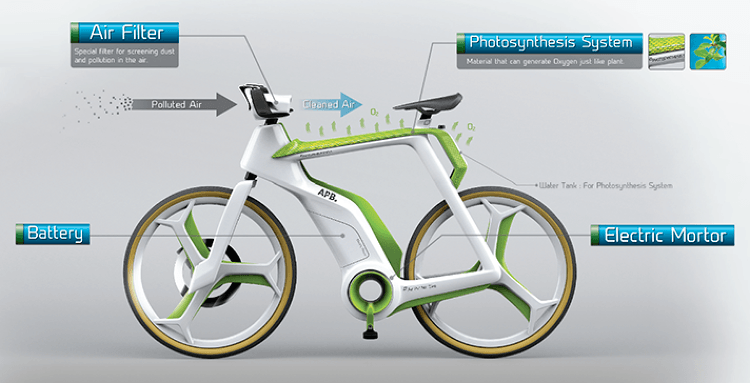 The bike frame houses the photosynthesis system. When the bike is parked, the air-purifying functions can continue under battery power." According to a report on the bicycle and the designers behind it on the Fast Company Co.Exist site, the designers presently have mock-ups, but they have not yet built a prototype; they plan to build one soon. Earlier this year, Lucintel, a consulting and market research firm, analyzed the global bicycle industry in "Global Bicycle Industry 2013-2018: Trends, Profit, and Forecast Analysis". They noted that government initiatives to promote cycling to reduce carbon emissions and noise pollution are a strong growth driver. In addition, bicycles' energy efficiency, coupled with cycling as a fitness activity, will help propel demand during the forecast period.